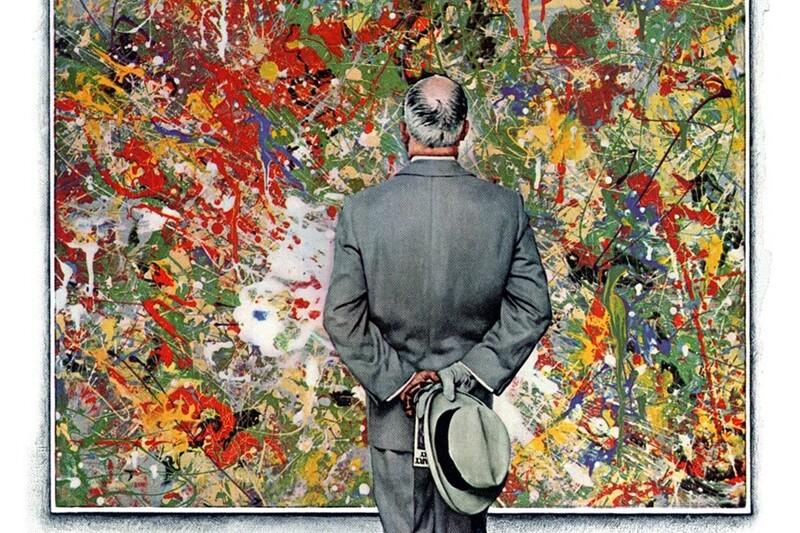 Norman Rockwell’s The Connoisseur is a playful look at his take on modern art. See all of the videos in our Rockwell Video Minute series at saturdayeveningpost.com/category/rockwell-video-minute/. Rockwell’s drip painting was/is beautiful!! It’s not easy to create what appears to the average person as just drips on a canvas; I’ve tried it myself. I love how Rockwell submitted a section of this painting to the Cooperstown Art Assn. under an assumed Italian name, taking the top prize and then having it declared BETTER than Pollock’s! I wish he could have done that with the ultra-snobby, phony New York art crowd that looked down on his art, but rave over a single dot on an otherwise empty canvas, or the infamous contents of an emptied vacuum cleaner bag with straight faces. People like that need to be sucked up in huge vacuum cleaner themselves, or perhaps scooped up and dumped into a ‘Soylent Green’ type garbage bin. Which filthy choice do YOU feel does them the most justice?